Day 8 of our trip began with another fantastic Israeli breakfast at the Mount Zion Hotel in Jerusalem. Our first visit of the day was to Yad LaKaShish, a workshop for senior citizens and people with disabilities. Since 1962, Yad LaKaShish has been serving late life immigrants from many different countries who are no longer able to pursue their professions. 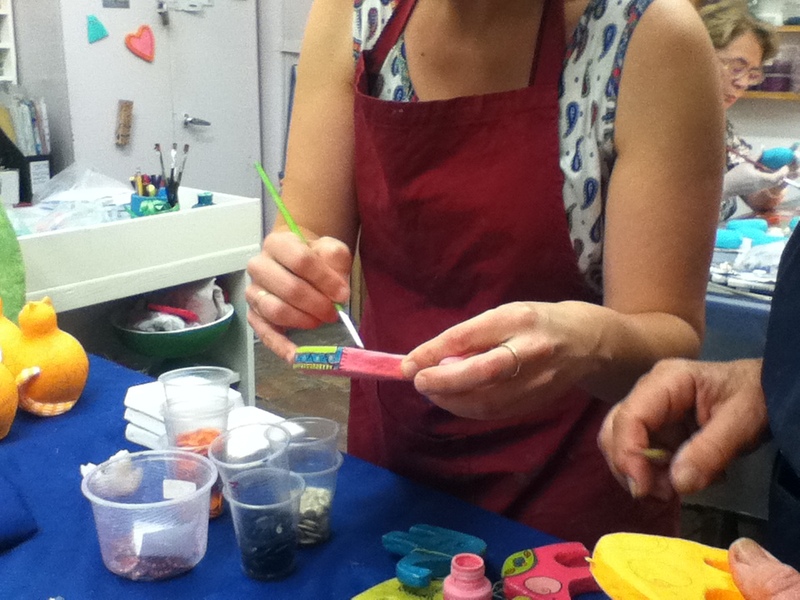 The organization trains these people to use various tools of art. We spoke with some of the people in the workshop and watched them create beautiful textiles, beads, papier mache figures, metal sculptures, etc. Their creations help support the work of the organization. The gift shop was crammed with people eager to buy unique tallitot, jewelry with handmade beads, cards, and much more. 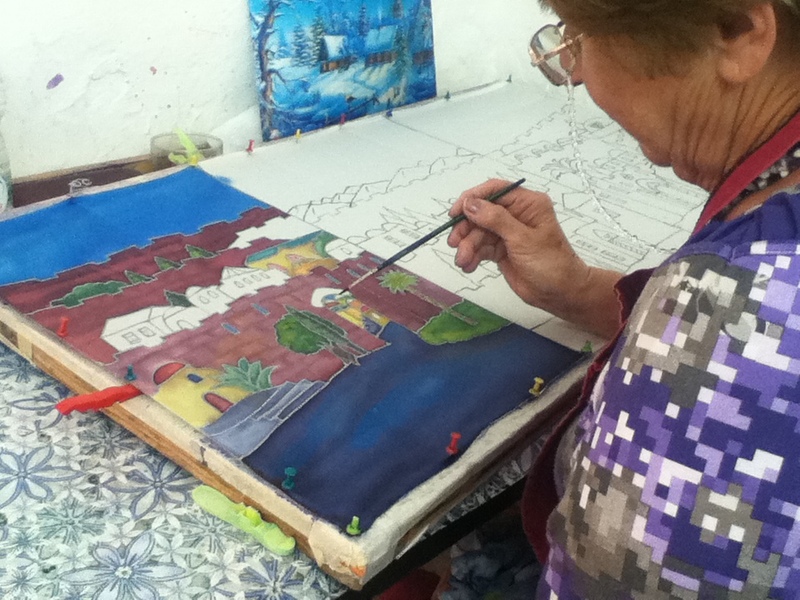 The workshop employs 300 of these senior artists 5 days a week, and once trained, an artist remains part of the workshop team for the rest of his/her life. Not only do artists in the workshop earn extra income to supplement the support they receive from the government, but they also regain a sense of purpose and become part of a close community. It’s not surprising that there is a waiting list of 1-2 years to join the workshop. Yad LaKaShish was special also because of a St. Paul connection with Hands and Heart. After the workshop visit, we took a walking tour through the Jewish Quarter of the Old City and saw excavations of some of the old structures. From the 1st Temple period, we saw the Broad Wall, which saved Jews from an Assyrian invasion. The wall was built through a neighborhood, using stones from the neighborhood houses. It was still possible to see the corner of one house poking out from the wall! 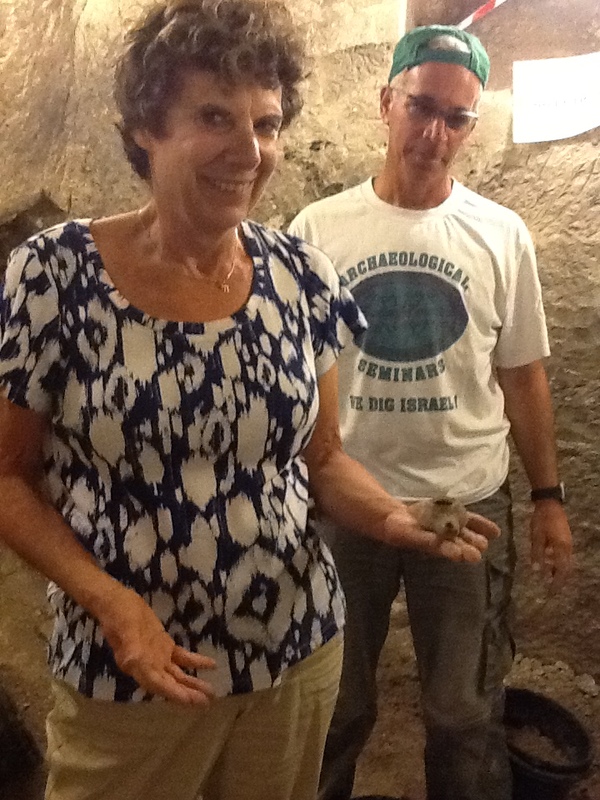 Our guide, Zvi, did a great job of tying the archeological remains to biblical passages. Further along on the walk, we saw the excavation of ruins from the destruction of the 2nd Temple. 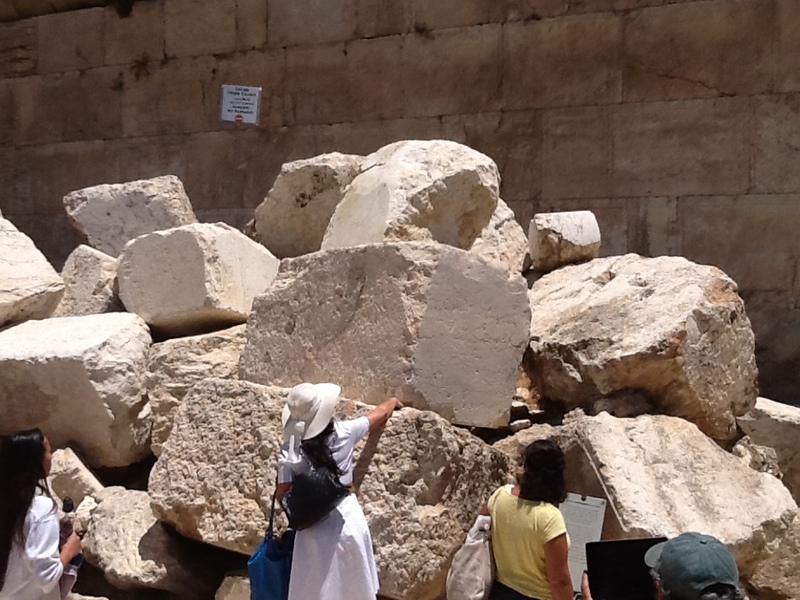 We could see the pile of toppled stones exactly as they had fallen on the 9th of Av. Zvi then called our attention to a Hebrew inscription high up on a part of the wall that had not been toppled. The inscription, which is a quote from Isaiah, was written in 360 c.e. long after the temple was destroyed and buried. It says, “If we can read this, we should rejoice” (because we are still here). Rabbi Spilker noted that the destruction of the 2nd Temple marked the point when Judaism moved from Temple to synagogue, from Priest to Rabbi, and from sacrifice to prayer. Judaism became less centralized and more democratic. We proceeded to an excavated area that was once Jerusalem Main Street, running along the western wall of the Temple Mount during the time of Herod the Great. We could see the pillars and arcades from 2, 000 years ago and it was easy to picture crowds and activity on that street. Next we climbed the Southern Steps, the main entry for people making pilgrimage 2,000 years ago to the Temple on Passover, Sukkot, and Shavuot. After a quick lunch, we walked down to the Kotel. Several bar mitzvahs were in progress on the men’s side, with female family members standing on chairs along the dividing barrier to watch, cheer, and throw candy. The way back up the stair/street from the Kotel was packed with people moving in both directions. Bar mitzvah groups heading down to the Kotel created an exciting atmosphere with their Israeli “party motivators” who blew trumpets and beat drums. It felt and sounded like a parade in New Orleans. At this point, we split up into two groups. One group took part in an active dig in the Beit Guvrin Caves, a 2,300-year-old site from the Hellenistic period. We found many large pieces of pottery, but Nancy wins the prize for the most exciting find: an oil lamp (in perfect condition and still with some soot!) from the time of the Hanukah story! Our guide Asaf showed us pictures of other finds from the same site, the most significant of which was a large slab of writing declaring that a Greek man H—(can’t remember his full name) was authorized to collect taxes from synagogues. Asaf explained that the revolt in the Hellenistic period began as a protest against a Greek tax collector, and once again we were able to connect concrete archeological finds to the old stories, which was very exciting. 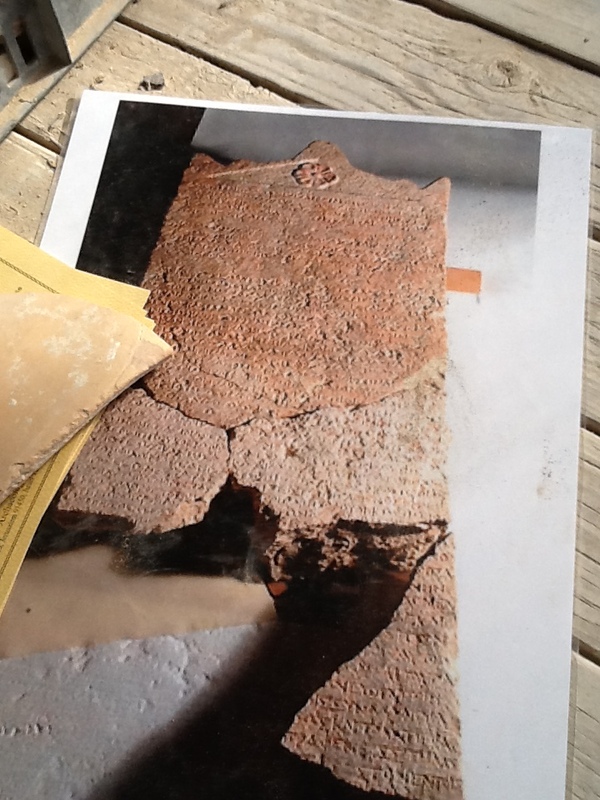 Picture of slab from same site. 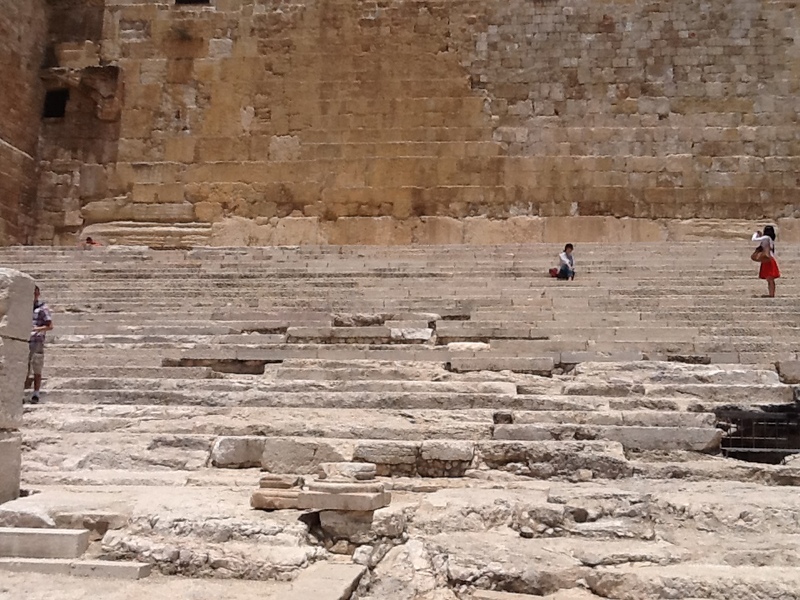 Our guide, Asaf, said it was the most important archaeological find in Israel. After we dug up relics in the basement of the house where Nancy made her museum-worthy find, Asaf brought us to a cave that served as the entry to a building on the site which they had not yet excavated, so everything we saw there was exactly as Asaf and his team had found it. We crawled through tunnels and squeezed through some narrow passages in the cave. Throughout the site, we saw walls with cubbyholes carved into them. At the end, Asaf explained that these cubbies were nest sites for birds and that the building we had just crawled through was a columbarium (a kind of barn/stable/shelter for pigeons). The people were likely raising the pigeons for food, and indeed we had found bird bones in the basement of the house where we were digging. I said that we had split into two groups and only one group went on the dig. The other group went to the Israel Museum. http://www.english.imjnet.org.il/ I was with the dig group and can’t go on expansively about the museum tour, but I’m told they met a director/architect of the museum with a connection to our synagogue in St. Paul. He brought them to see some 9 thousand year old masks found in the Judean area! We had already had an amazing, full day, but we were unstoppable! 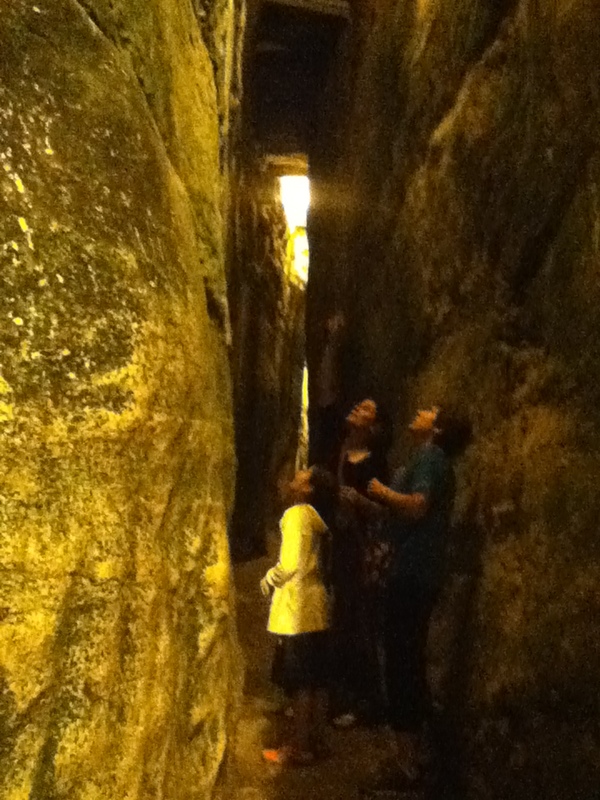 Shortly after dinner, we headed out again for a nighttime tour of the recently excavated tunnels along the Western Wall. Our guide had a 3-D model that came apart like a puzzle so that she could show us how the Temple Mount was built in Herod’s time. She also showed a computer animation of the Temple’s destruction and explained how the fallen Temple Mount remains were buried by the Mameluks (“and the papaluks and the babyluks!” we all shouted). So the excavated section we were looking at was underneath the village they had built, and it was a continuation of the famed Kotel. She also explained that, while the Ark from the first Temple has been lost, the Holy of Holies (a stone that is part of Mt. Moriah) from the first and second Temples is still there and is buried under the Temple Mount. The fact that the Kotel is closer to the Holy of Holies is what makes it more important, even though it has been less accessible over the years than, for example, the Southern Wall. As a matter of fact, as she clarified with her 3-D model, the section of the Western Wall that is the very closest to where the Holy of Holies is can be found in the tunnels where we stood. The stones in the tunnel are in amazingly fine condition, with clear sculpted ridges made in the time of Herod. One stone was by itself almost 500 tons.